“We should not trouble those Gentiles who are turning to God…[this] has seemed good to the Holy Spirit and to us” (15:19, 28). As people of the Way we are called to adaptability: “We should not trouble those Gentiles who are turning to God…[this] has seemed good to the Holy Spirit and to us” (15:19, 28). Christians have always had a tendency to think that the way we did things when we grew up, the things we were taught as children, these things were the “traditional way,” the way things had always been before, and that it’s only now that things are changing. But this is not true. Over the generations there have been thousands of changes: some big, some small, some unintentional but many very deliberate, adjustments based on necessity, changes reflecting culture, adaptations prompted by the Spirit. Christian history is a history of nearly constant change. 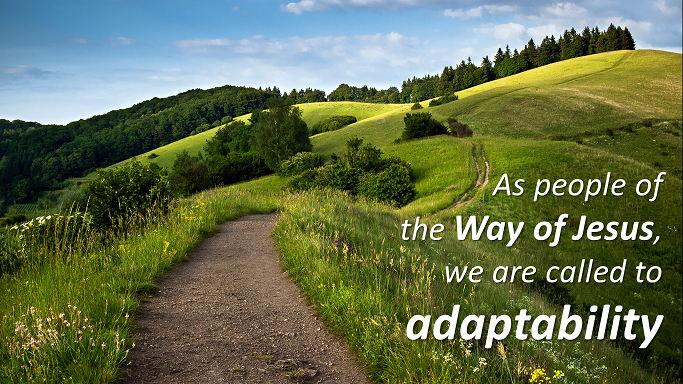 Acts 15 demonstrates the early Church’s adaptability, following the way of Jesus. Scripture and tradition seemed clear: the people of Yahweh are defined by the covenant of Moses, keeping the Law of Moses, so Gentiles must become Jews. Yet the Spirit seemed to be doing something different: Gentiles were being included in God’s people, sharing in God’s Spirit equally, without becoming Jews. These stories of the Spirit’s new work in a new world were decisive, and they determined that what had once been thought an “essential” was now no longer so. They thus adapted to a changing world while remaining faithful to the true essentials of Christian faith and practice: Jesus, and Jesus’ way of love. How have we at Morden Mennonite Church adapted to a changing world while remaining faithful to Christian essentials? In what ways might we need to do that again now? or in the near future? Based on a sermon delivered at Morden Mennonite Church on November 1, 2015. This entry was posted in Michael Pahl and tagged acts, adapt, adaptability, change, church, culture, jesus, love, people of the way, tradition. Bookmark the permalink.